Move beyond the fantasy of the “smart city” and identify the real opportunities and risks inherent in digital technologies for sustainable and inclusive development of your territory. How can we ensure that ICT development effectively contributes to greater sustainability and inclusion in cities? In which direction can local authorities direct this transition and innovation? 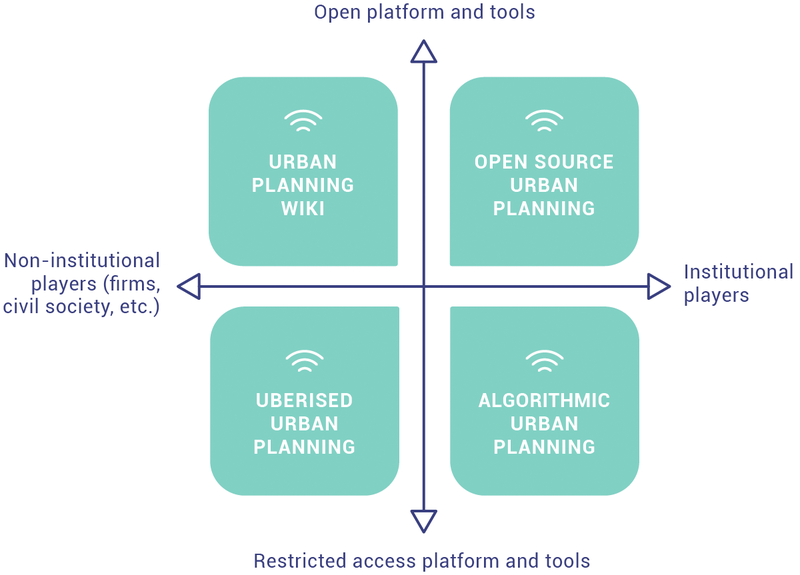 The first step is to clarify collective expectations in terms of sustainable urban development and adopt a political project that could be based on digital tools. A clear vision of the opportunities and limits of digital technologies is necessary. This vision will allow the local authority, as guarantor of the public interest, to structure its action and the initiatives of third parties. Digital technology should be at the service of its political project. Schematically, we can sketch four models of “smart city” influenced by ICT. This typology is schematic. Nonetheless, it allows us to define scenarios that can be used to draw attention to the risks and limits of trends pushed to their extreme. Depending on the orientation chosen, the participation of non-institutional stakeholders and the degree of openness and access (internally or externally) to the data and digital tools will be more or less necessary. By taking position on the “compass” of digital technology, the local authority can start to identify the type of approach and the role to be adopted. Different alliances, tools, contractual arrangements will result. The further to the left of the compass, the more the local authority should build and ensure its positioning vis-à-vis third party players. The lower the position, the more the local authority must defend its legitimacy and the accountability of the decisions in the public debate. What must digital technology contribute to as a priority in my city? The sustainability of my territory? : planning and forecasts; better knowledge of the territory; constitution and analysis of databases; preservation of natural resources, etc. Modernisation of the local public action of my administration? : efficiency of the management procedures; reduction of administrative costs and time-frames; relevance and legitimacy of the decisions by defining priorities in accordance with the needs of the population. The way private stakeholders, formal or informal, the population and even the local authorities make use of ICT generates unexpected effects. These initiatives are often situated where public services are weak or absent; they fill up the gaps and meet unsuspected needs. The local authorities can discover new niches for urban policies that previously were not in the scope. Part B of the guide describes various actual and possible uses of digital technology in developing cities in four traditional urban functions, accompanied by examples: management of urban services, planning for the most vulnerable, relations between administrations and users, and local economic development. We must therefore first of all return to basics: digital technology depends on information and communication technologies. It is not only a question of managing the city using data, but also of an ecosystem of stakeholders connected through digital devices. Of course, the effects of communication and information become intertwined: information serves as the foundation of new relations and the exchanges generate data. The arrival of digital technology obliges local authorities to take position. ICT is shaking up the world of information and digital tools, opening up new opportunities for knowing, managing and anticipating the way the territory is changing in a much faster, more responsive way. Digital technology renders perceptible activities, urbanisation areas, categories of population, or even social movements, which previously had little visibility. This obliges the local authorities to define a position and a strategy for action. Producing, collecting, storing, processing, analysing and sharing data: which action(s) must the local authority take charge of? Which types of data that are important for municipal development and public action should be given priority: statistics, council decisions, maps, civil registry? For what purposes should the local authority use and exploit the data generated: knowledge, forecasting, controlling, programming? For which users: the local authorities, third party public authorities, the private sector, citizens? What are the limits to be anticipated: data storage capacity, data formats, ignorance of the problems for which there is no data? Facilitate communication and the exchanges between the stakeholders of the territory. Which priorities: connect the stakeholders who are disconnected, foster the emergence of new stakeholders, encourage new ways of exchanging? Which stakeholders: connected users, vulnerable populations, the private sector, informal sector, the NGOs? To what ends: to raise awareness, consult, open new markets, tax, census? In what form: information campaigns, forums, call centres, social networks, trade services? With what limits: feed the practices that bypass local authorities; develop a supply and demand system that excludes the most vulnerable; dependency on intermediaries? The question of exclusion or the digital divide is not only a question of access to the new technologies or network coverage, but takes in more broadly the issues of pricing, social acceptability, gender, age, appropriation and literacy. to design systems suited to their needs and capacities. While introducing municipal services on digital media, it is therefore important to maintain physical services, ensure the presence of facilitators to accompany the users, and design tools and interfaces accessible to all (including the illiterate). Setting up partnerships, planning a training budget, or making equipment available are municipal actions that can easily bring together the conditions necessary for an inclusive digital transition. The NGOs, the universities or educational institutes, the stakeholders in the social and solidarity economy (SSE SSE Social and solidarity economy. ) or again the third places Third places Correspond to social environments other than home and work. These are physical spaces where individuals can meet, come together and exchange informally in response to the needs of a community present. Third places all have their own personality, depending on their location and the community that is present there. Co working spaces are considered specific third places. and incubators Incubators Support structure for business creation projects. Provide know-how, a network and logistics during the first stages of the life of the company. Incubators address companies that are very young or in the course of being incorporated. who democratise the use of digital technology can be relays and mediators. The local authority, for its part, can take the responsibility of identifying the target populations, and the intermediaries who can work with them. Who are the people excluded from digital technology or from the service to be developed: senior citizens, women, peripheral neighbourhoods, informal sector? Why are they excluded, what are the obstacles they come up against: cost too high, literacy barrier, cultural practices, zone not covered? How can they be included, what targeted system can be put in place to include them: digital literacy classes, digital mediation, communication campaigns, public facilities and access, simplified design? Which partners can be involved: which intermediaries are the best placed to transmit the knowledge and know-how necessary for the appropriation of digital tools?